Maharishi restored the crucial understanding and proper practice that Vedic recitations should be projected from awareness grounded in the silent Transcendental level of speech, where the link between sound and form—between desire and fulfillment of desire—is intimately connected and enormously powerful. This skill, of necessity, incorporates the practice of Yoga—the Transcendental Meditation and TM-Sidhi programs, including long Yogic Flying—and the resulting enlivenment of the Transcendent source of speech prior to the recitation and performance of Yagya. Only Maharishi Vedic Pandits have this crucial training and skill. Maharishi dedicated years to the careful, systematic revival of Yagya, restoring this ancient technology to its full power. This restoration and revival includes, in addition to the practice of Maharishi’s Technologies of Consciousness, a far more comprehensive training of the Vedic Pandits in proper recitation and pronunciation. This extensive training over many years has been developed and instituted under Maharishi’s close personal guidance, in collaboration with the most revered Master Pandits from across India. Graha Shanti are Maharishi Yagya performances to bring life in tune with the cycles of Nature responsible for delivering the results of one’s past actions. They promote good fortune and neutralize any negativity before it can arise. The word Shanti means peace or harmony and Graha, is roughly translated as planets, but actually can be understood as the forces of Nature that influence our progress in all areas of life. Graha also can mean “that which grasps or seizes" and modern science has shown that the Grahas are correlated with core components of our brain, cells and even our DNA, which structure our experience of life. In this way, we can understand how Grahas can color our feelings, thinking and activity in a positive or negative manner. Avert the danger that has not yet come. We all know that the best protection is prevention. A Graha Shanti Maharishi Yagya helps to release the grip of the Grahas, freeing us for greater success. In addition to Graha Shanti Yagyas to protect us from unfavorable influences, there are also Maharishi Yagya performances to bring support of Nature to any area of life including: health, peace of mind, harmonious family relationships, increased wealth, business success, and spiritual progress. Birthdays, weddings, anniversaries and the birth of a child are all highly significant moments in the blossoming of life. Maharishi Yagya performances bring support of Nature to the individual and the family at these times when specific Laws of Nature are particularly lively and accessible. 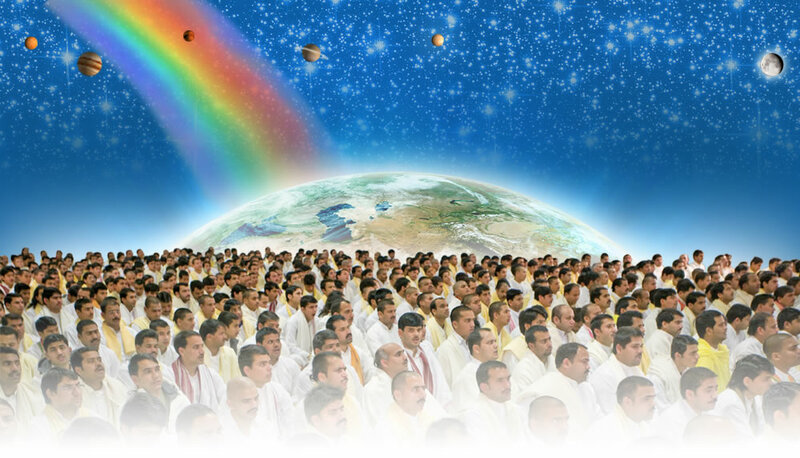 The Maharishi National YagyaSM program is a powerful application of the technology of Maharishi Yagya on a national scale to prevent problems and improve the fortune of an entire nation. These National Yagyas continue over many days or even weeks, depending on the size of the desired effect and the magnitude of the problem being averted or defused—for example a natural disaster, violent outbreak, or severe economic downturn. In appreciation for his achievements Dr. Nader was honored by Maharishi with the title ‘Maharaja Adhiraj Rajaraam’ and given responsibility for guiding the Global Country of World Peace, the umbrella organization for Maharishi’s worldwide legacy. Maharaja is now fulfilling Maharishi’s goal of applying Vedic Science to end problems in all areas of life and create permanent world peace. Maharishi Yagya performances help support the global peace-creating Maharishi Vedic Pandit program and the training of a new generation of Vedic Pandits, fulfilling Maharishi’s initiative to revive and perpetuate the precious Vedic heritage so that everyone throughout the world may enjoy Raam RajSM Jyotish and Yagya for Heaven on Earth.